Chesterton was a brilliant English journalist, essayist novelist and poet. He died in June of 1936. He was a man of enormous wit, great size and even greater faith. It was also famously observed that he was, at heart, a jester and it was in this role that Chesterton was able to have the most impact. He was able to be funny because he was serious. And he was able to use jokes, paradoxes and his often rhetorical switchbacks because of his confidence in his truth. The quote above is a good example of Chesterton’s style. When reading him I find myself continuously nodding in agreement and reaching for my highlighter. It’s a shame he isn’t read more widely. 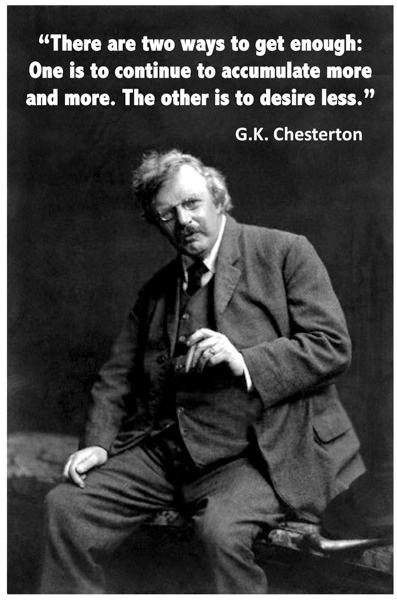 Chesterton is absolutely spot on in the above quote. Who would dare deny it? I am especially drawn to that last word. We all know who the powerful are, or we assume we do. But, what if we put Chesterton’s quote in a larger context? What if we look at it from a slightly different perspective? Who are the powerful in a world where hunger stalks the majority of our human family? Who are the powerful that always have more than enough food when most know only lack and hunger? Who are the powerful that have the resources to share but refuse? Who are the powerful that have the freedom to speak out for justice on behalf of the hungry yet keep silent? Chesterton is right. An enormous amount of modern ingenuity is expended on finding defense for our indefensible conduct. This entry was posted in Hunger & Poverty, Quotes and tagged food, freedom, G. K. Chesterton, hungry, indefensible conduct, justice, modern ingenuity, powerful, resources on June 30, 2014 by Ray Buchanan.